A few months back when I flew out to California to visit my sister so we could make holiday cards together, we saw some cute needle felting projects in one of the stores. I mentioned I didn’t know anything about it and I was curious. My sister took note and got me a cute little needle felting kit for Christmas. This weekend I finally got around to using it. 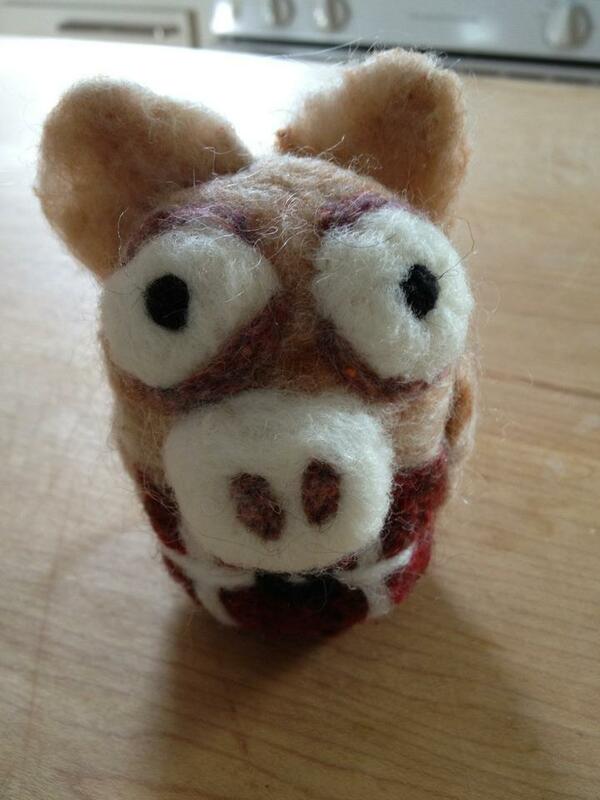 I made this funny little pig. I actually kind of love this funny little pig. When I first started the project I thought it was kind of boring and repetitive, but the more the little pig took shape the more delighted I was with the whole process. It started sparking ideas for what other things I could make, and suddenly I had a growing list of ideas. The fun part is that they are not all felting ideas. Creativity does indeed spark creativity. Nice. This entry was posted in Opus, The Daily. It’s awesome to hear you get your creative on. What’s next? Inquiring minds want to know what else is cooking in that cauldron of creativity between your ears!